At its core, the relationship between a customer and a lawn care business is relatively simple. But it becomes much more complex and nuanced when you toss in all the possible services and how often they’re done. A lawn maintenance contract helps clarify any discrepancies that may arise in a relationship. 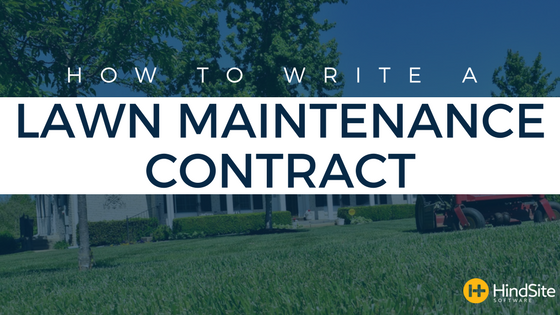 You’ll be able to refer back to it and say “as you’ll see here, we agreed to [blank] every [blank].” Creating a lawn care contract shouldn’t take a ton of time but it's a lawn care business essential and can save you (and your business) from a great deal of trouble in the end. What you’ll find in the sections below is everything a lawn care company could possibly want (or need) to include in their contract. I thought it would be better to be thorough, than to skim over the topic, leaving something out and getting a business sued. It’s likely you won’t want or need to include all of it - it’s quite exhaustive. QUICK DISCLAIMER: I’m not a lawyer, below reflects basic advice on lawn care contracts. If you have further questions or concerns it’s always best to reach out to a real-life attorney. Grouping your services by their frequency is one way to help the customer better understand what’s going to be done and when. That means the services that are involved in the weekly (or bi-weekly) maintenance of their lawn should be in the same section. It’s also a good idea to state what’s not included in this regular visit when appropriate. Next, you’ll want to go over any service that has its own frequency. For example you might offer a “Turf Fertilization Program” that’s administered three times during the term of the agreement. If you’re not into the whole brevity thing, you can even include services that aren’t. Lastly, even though it might be included more towards the end of the contract, it’s a good idea to explain how any missed - agreed upon - service will be communicated to the customer and not billed. As you’re well aware of, lawn services can be priced in many ways. So how your contract presents your price(s) might be drastically different to that of another lawn care business. I’ve seen contracts that list all of the services then have the grand total at the end. The downside of this approach is the customer doesn’t know what makes up this price - they’re completely oblivious to the cost breakdown. Conversely, I’ve seen contracts that attach a dollar amount to every little service, leaving the customer's head spinning and uncertain of what they’ll actually be charged. Basically, instead of telling you to do it one way or another, I’m telling you the two extremes and leaving how to present your pricing, up to you. Just make sure that the price is somewhere in your contract and the customer understands how much they will be paying. How do they pay? What if they don't? Somewhere in your contract you’ll want to include invoice-related details. You should clearly state how they can pay (e.g. check, cash, credit card, direct debit), what their pay period is (e.g. 30 days of the date of invoice) and what happens if they fail to make a payment (e.g. lawn service will cease until payment is made or all balances 15 days or more past due are subject to a certain service charge). Vice-versa, it’s a good idea - especially if you offer auto-billing and auto-payments - to state how you’ll return any payments made on mistaken charges. Like any legally-binding documents, it’s vital to clarify any ambiguities in your lawn care contract. This varies, but can be anything from special provisions to modifications or amendments to who’s responsible for certain damages to causes of termination to insurance coverage. We put together a few lawn care contract templates to help you get started. This excerpt is from our new eBook “Lawn Care Business Essentials.” Click below to read the entire free eBook.